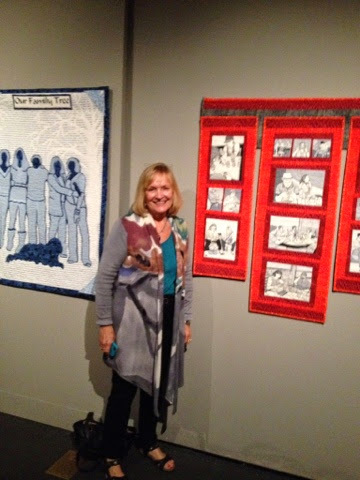 I was honored to be asked by my friend, Terry Waldron to be part of the Quilts exhibit at the Muzeo Museum and Cultural Center in Anaheim. 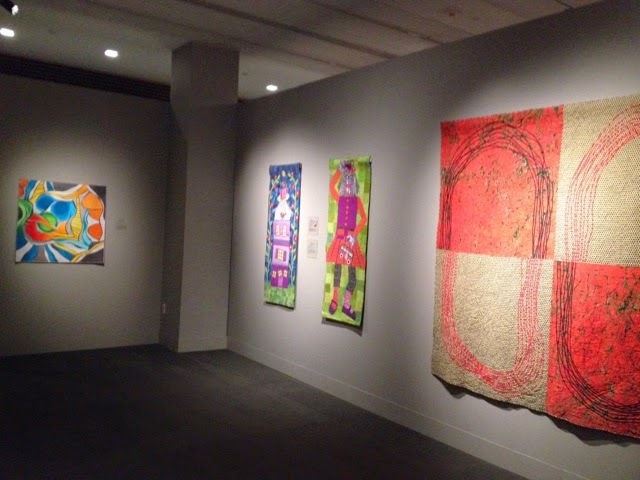 18 contemporary quilts by nine California artists. 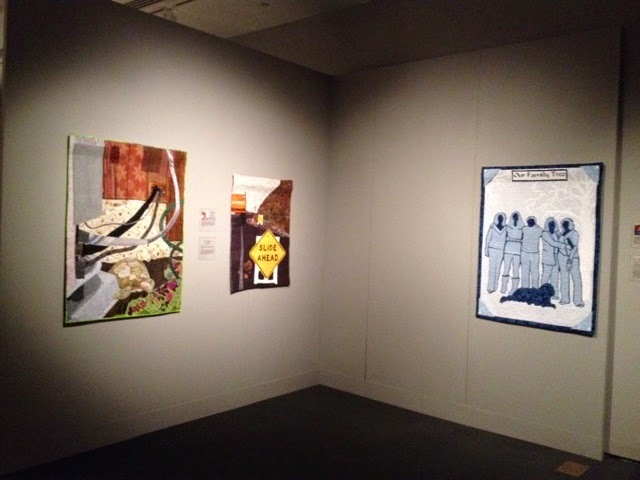 These are Terry's two art quilts above. 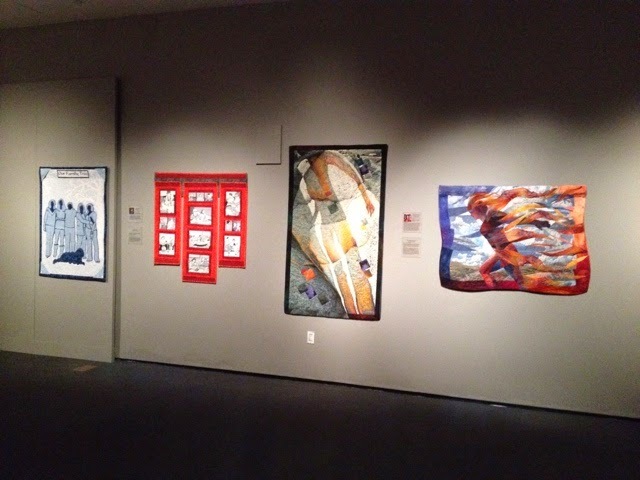 There is an exhibit of traditional quilts (26) from the International Quilt Study Center in Lincoln, Nebraska and an exhibit of art quilts by California artists. 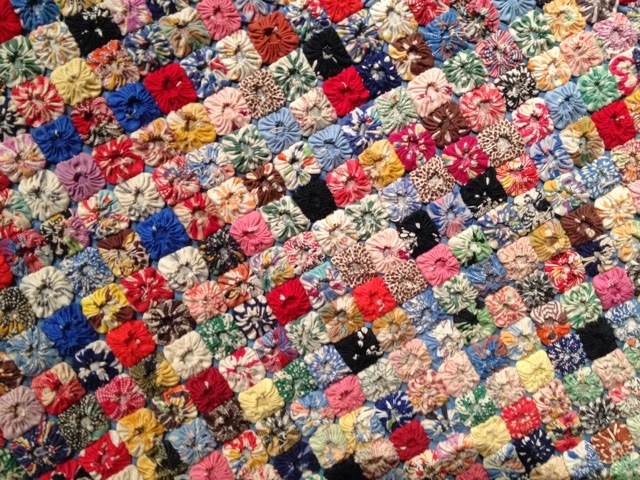 This is a close up of one of the traditional quilts, mini yo yo's. Oh my! I can appreciate the work, but I don't want to do it. 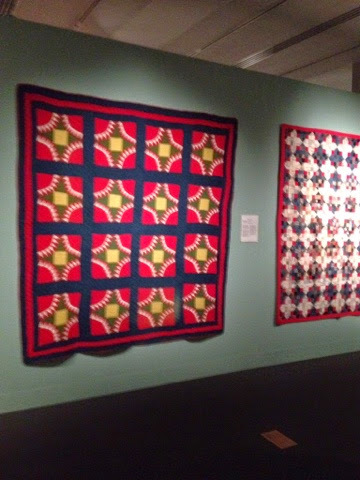 One wall of many in the traditional quilts section. I love this one, although I apologize for the quality of the photo, taken on my iPhone. 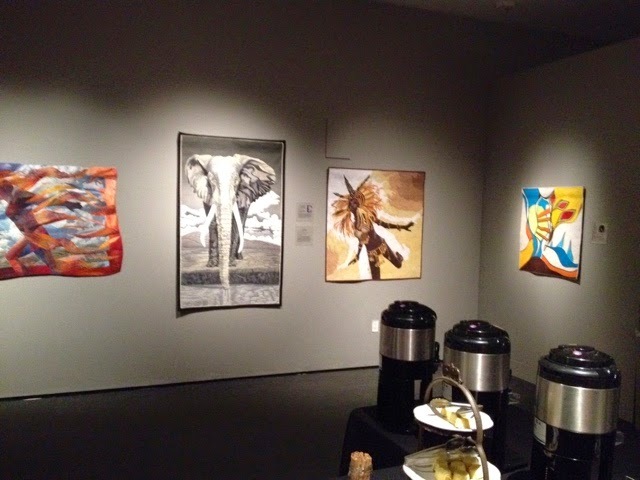 The art quilt gallery - one section. 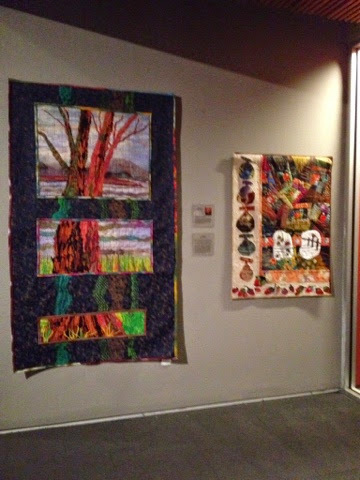 Sheila Frampton Cooper's colorful quilt on the far left, my 2 quilts, and one large one by Joe Cunningham. 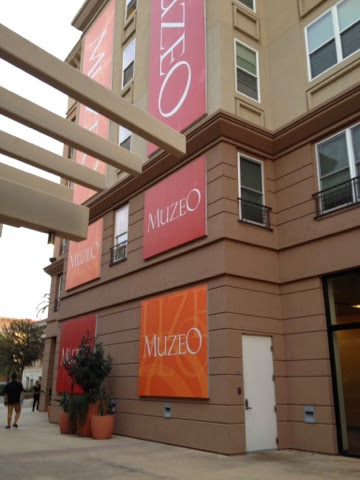 The sign at the opening of the exhibit, which should have been at the top of the post, but when you are blogging on your iPhone, it just comes out a different way. The California artists in attendance for the artists opening. 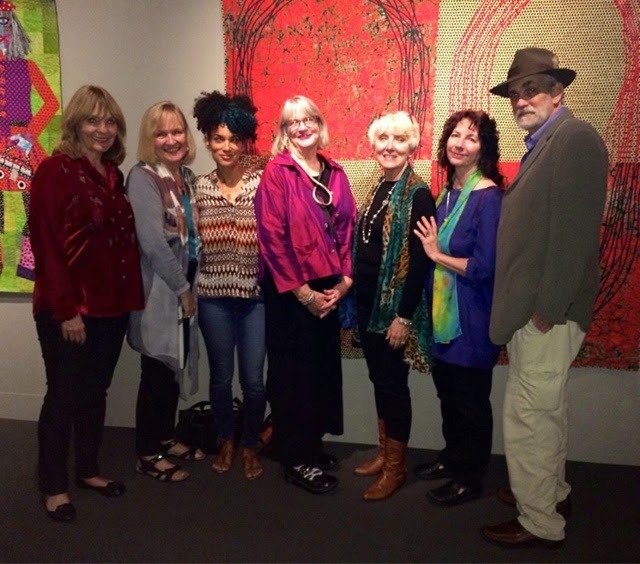 L-R, Terry Waldron, Sherry Kleinman, Sheila Frampton Cooper, me, Linda Anderson, Lura Schwarz Smith and Kerby Smith. Artists that could not be there are Joe Cunningham and Cindy Cooksey. 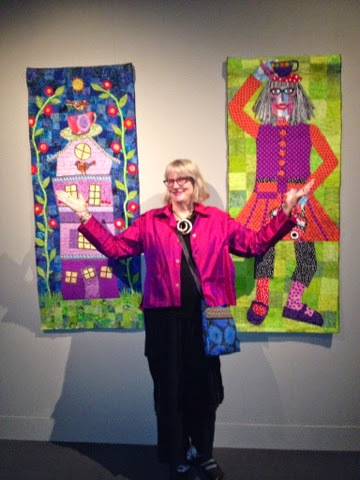 Me and my two quilts. "Make a Wish on the Purple House" and "The Happy Dance" - originally made for Dinner at Eight Artists exhibits - Rituals and An Exquisite Moment. Me and Sherry Kleinman. 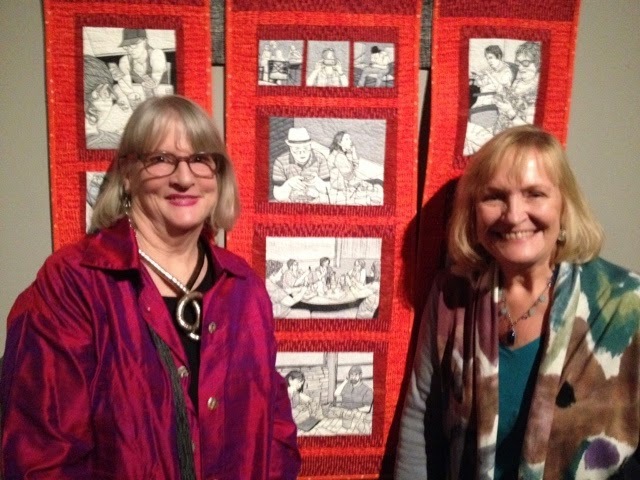 The center section of this quilt, third image down is of a groups of us from Dinner at Eight Artists, who hung an exhibit at Festival in Long Beach, and Sherry took a photo of all of use looking at our phones, for this particular quilt. 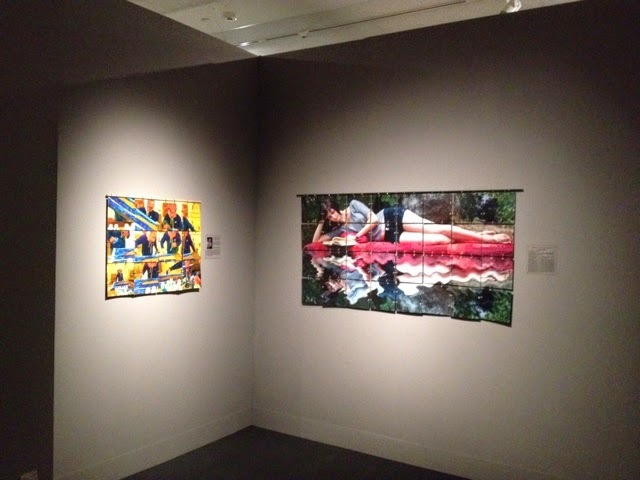 Two by Cindy Cooksey and one by Sherry Kleinman. 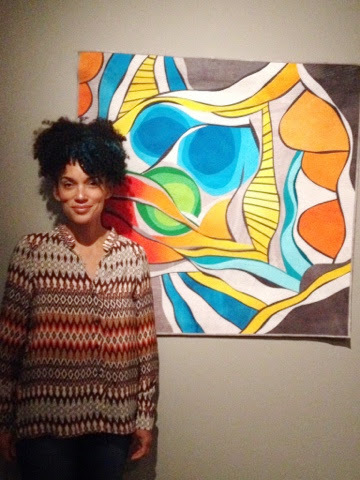 It is such a fabulous exhibit. 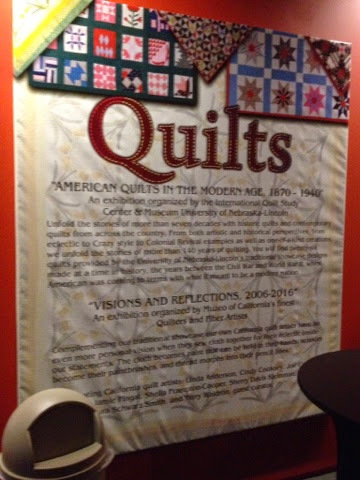 If you get a chance to see it in person, you will be astounded by the work, in both traditional and contemporary worlds of quilts. This is just SOOO cool! Congrats!